I’m into beetroot at the moment as I discovered I had some beets in the fridge that needed to be consumed. 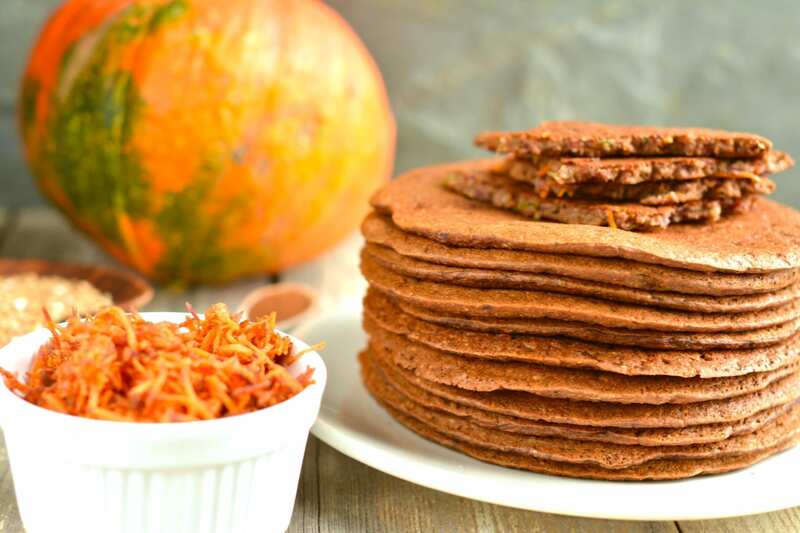 So I’ve been making beet pancakes, beet muffins and adding oven-baked beetroot to salads. I think that beet brownie is up next. And of course I’m delighted that this deliciousness is back in my menu after candida cleanse. I can do so many things in the kitchen with those lovely starchy veggies. As with my Candida diet friendly Butternut Squash Muffins I also struggled with this recipe a bit baking three batches before they were perfect. In the first batch I used oven-baked beetroot and raw grated carrot and sweetened the batter with stevia drops. They came out delicious, but maybe a bit too moist and not sweet enough for more conventional taste. So, I substituted half of the baked beetroot with raw grated beet and doubled the number of stevia drops. 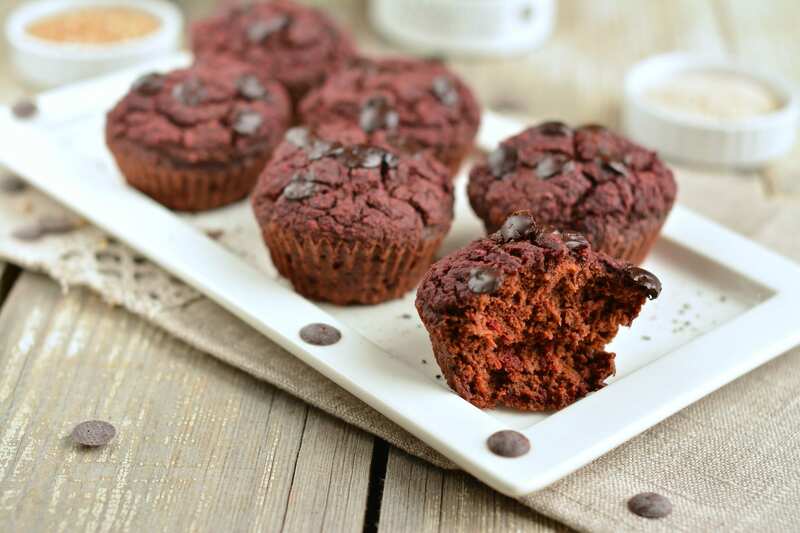 The consistency of those beet muffins was much better, but my hubby said that they could still be a little bit sweeter + he could sense the aftertaste of stevia. I guess I’ve gotten so used to the taste of stevia as I’ve been using it on daily basis since I started my vegan Candida diet that I didn’t feel a thing. My 6-year-old kid was munching on both beet muffin batches saying they were perfect and that he wouldn’t change a thing. I’m just super-happy about his palate! So, I used xylitol to sweeten the third batch of my oil-free vegan beet-carrot muffins and finally they were ready for public sharing. Of course, if you can, use soft dates instead – I so wish I could do that! 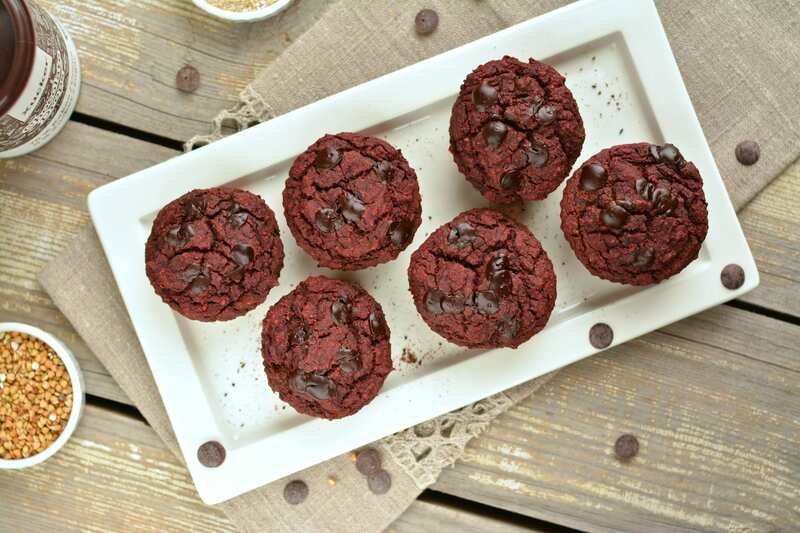 The chocolaty part of the muffins comes from cacao and carob powder (and of course the chocolate buttons). I used more cacao powder and less carob in the first two batches, but I’m so glad I decided to try it the other way around for the third batch as in my opinion less cacao and more carob works better with beets. When it comes to spices I also experimented with several combinations and found that just a bit of cinnamon with cloves is a perfect match. The muffins smell a bit like gingerbread, which is not a bad thing! 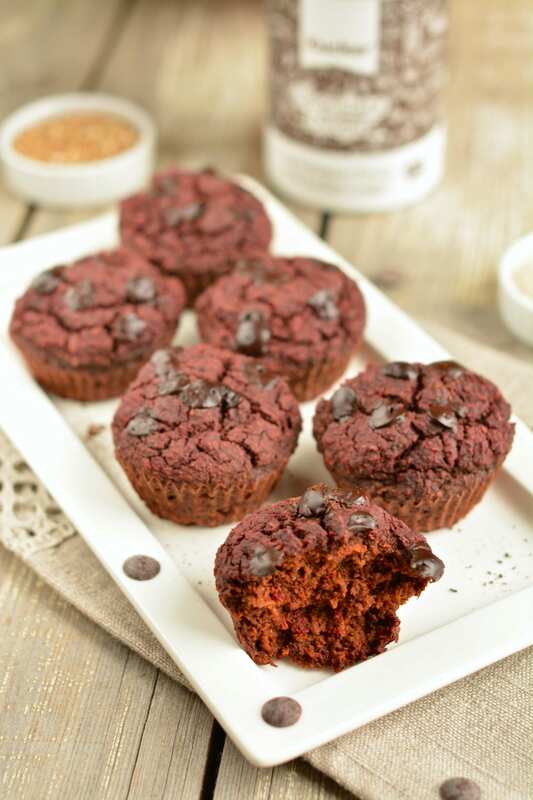 My Beet-Carrot Muffins with Buckwheat and Oat Bran are oil-free, refined sugar free, plant-based, vegan and Candida diet friendly. One might claim them to be gluten-free as well, but there’s a debate on avenin in oats – some people with celiac disease can tolerate gluten from uncontaminated oat products, but others react with an autoimmune response. Should you be one of those people, substitute oat bran with rice bran. Soak buckwheat groats overnight or for at least 6 hours, then rinse and drain. Finely grate and measure raw carrot and beetroot. Put all ingredients, except raw grated beet/carrot, into blender and blend into smooth batter. Finally mix in the grated veggies. Divide the batter between 6 muffin forms and add some dark chocolate buttons on top. 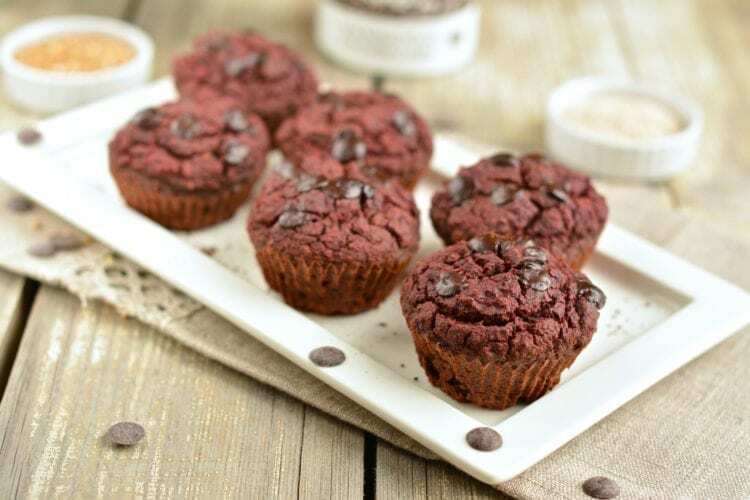 If you think that the muffins need more sweetness, feel free to add more stevia, xylitol or dates. You can replace tahini with any other nut or seed paste or even discard it and make them leaner. Make a double batch and freeze the leftover muffins. Heat them up in the oven whenever needed. If you use unsweetened nut milk or soy milk, you’ll most probably need to add more sweetener. Oat and rice milk is naturally sweet. 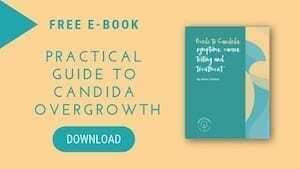 As I’m on Candida diet I used chocolate buttons that were sweetened with xylitol. However, you can also use grated 100% chocolate or cacao nibs instead.